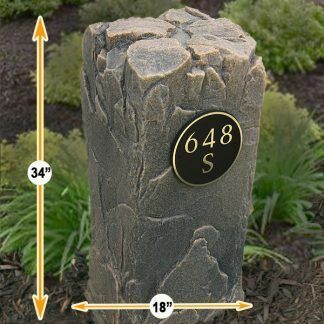 A beautiful and realistic house address rock with a hollow design perfectly suited for hiding objects in the yard or landscaped areas. Venting Is Important. View Venting Guide Here. Vents are color matched & installed. Please enter desired text. 16 Characters Max. If entering a street address consider leaving out the street name. People know what street they are on and the plaques are easier to read with fewer characters and larger print. Please choose desired text color. Please select desired rock color. This is a wonderful choice as a stand-alone address rock or it can pull double duty as a cover rock and address rock. The hollow rock is large enough to cover many water well risers and similar sized objects. 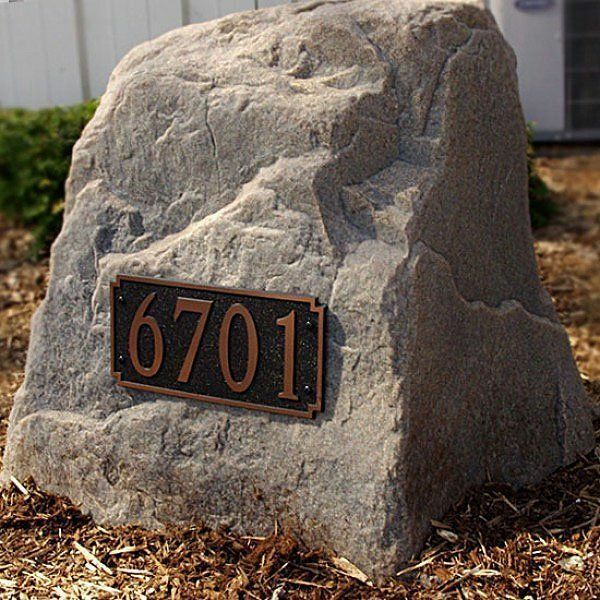 A great option for placement near walkways and entryways this complete address rock package arrives ready for action. 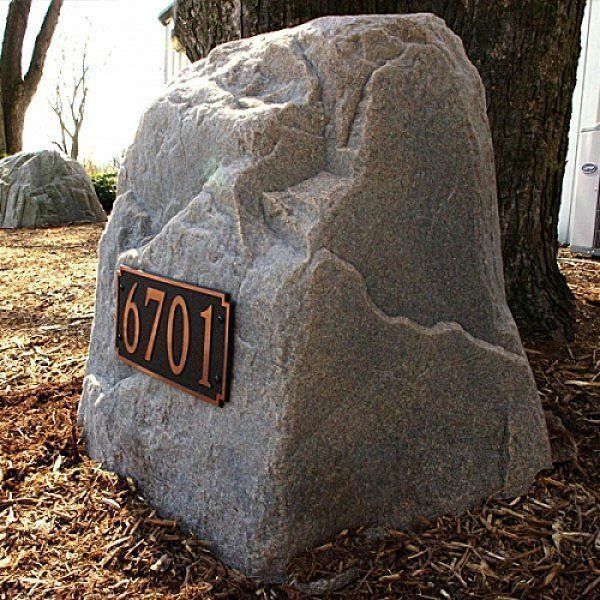 Just open the box and place the assembled house address rock outside in your yard or landscaping! 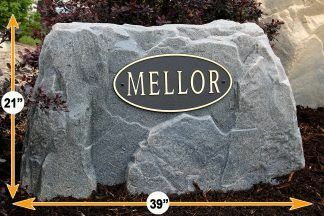 A Unique, Distinctive And Classy Personalized Address Plaque And Rock Combo. 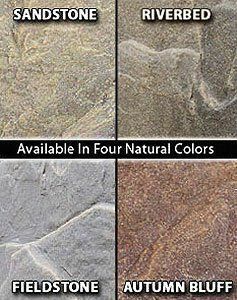 Artificial rock covers don’t get more realistic than the new “RealRock” line by Dekorra! This is the perfect marriage of realistic natural textures and colors that mimic actual landscape rocks with jaw-dropping perfection. 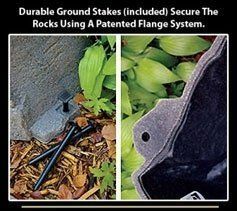 These hollow rock covers are formed by molding real boulders and rocks with specially formulated polymer resins, resulting in supremely detailed, ultra-rugged commercial grade products that look outstanding and are built to last! 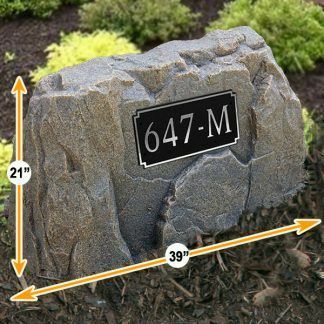 IMPORTANT: Please use the interior dimension charts to determine if this rock will work for your application if you intend to use it to cover an object. 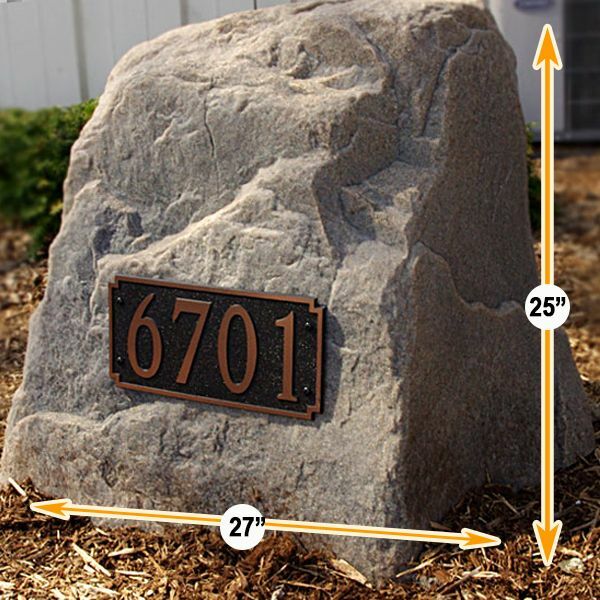 Or enter some quick object measurements into the form on this page and we will gladly make some rock recommendations for you. 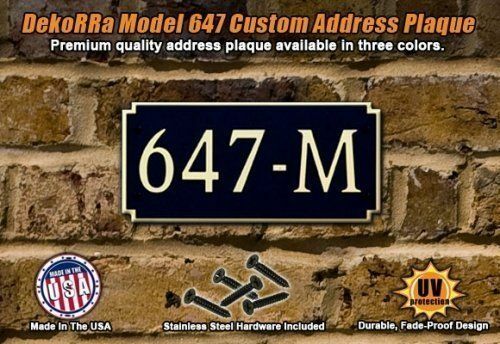 Nothing says “Welcome Home” like one of these professionally crafted personalized home address plaques by DekoRRa! 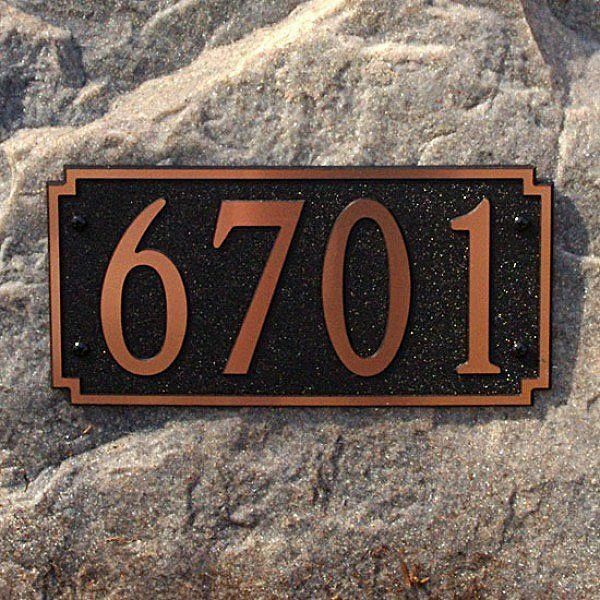 The quality and durability of these USA made number signs is simply unmatched. 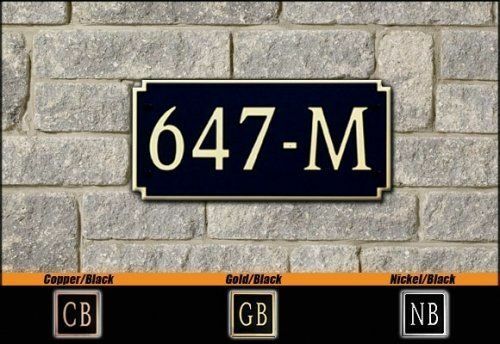 Display your house post numbers in elegant style! 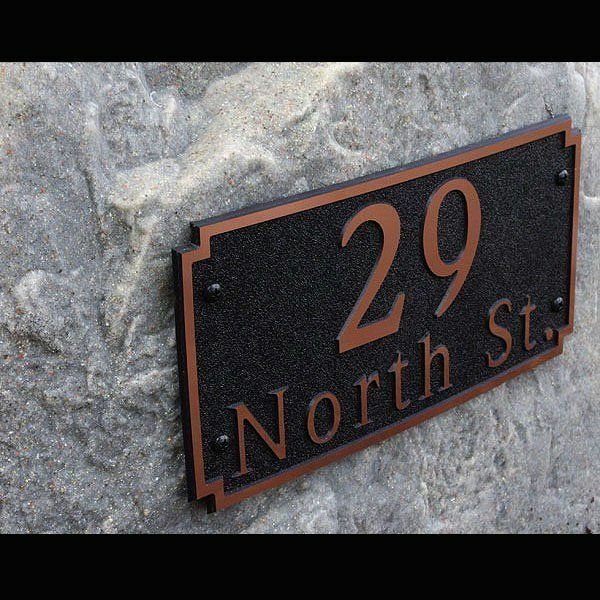 Available in one of three metal colors with bold, personalized text that is easy to read from any distance. Handmade in the USA, Each plaque is engraved, not stamped or cast like cheaply made competitor products. Exclusive “Paintless” design means no chipping or flaking. I bought this for my folks anniversary gift and they really dig it! Looks awesome! We don’t like how far down the plaque is mounted. Wish we would have bought the 115 model instead.